I know I’m not the only one suffering from dry winter skin. Between the constant hand washing, hot showers, and the furnace sapping the moisture out of the air, my skin is THIRSTY! I always apply lotion when I get out of the shower, and in the winter I will use coconut or body oil since it seems so much more in need of the additional moisture! I’ve been seeing lotion bars popping up everywhere – at beauty stores, online shops, and make your own recipes floating around on the internet. Since I’m more of a DIY girl, I figured I would just make my own! These were so simple to make. I did a total of 6 bars with shea butter and olive oil on the first batch, adding a little bit of lavender essential oil to half of the batch as a nice little bonus since I was gifting them. For my 2nd batch, I did a combo of shea & cocoa butter mixed with coconut oil. They smell lovely! I love these lotion bars. Rubbed directly onto the skin, they offer soothing, much needed moisture. They are all natural, so it’s nice knowing there are no weird additives or chemicals in them that can give my sensitive skin a reaction. I hope that you enjoy these as much as I do! The formula for these is very simple – equal parts beeswax, a carrier oil such as olive oil or coconut, and shea or cocoa butter. When using shea butter, be sure to add this last since if you add it with the beeswax and carrier oil it can turn grainy, which would be gross. I made a double boiler out of a pot and glass bowl, filling the pot up about halfway with tap water. Add in your beeswax and carrier oil. It took about 20 minutes for the beeswax to melt for mine, but I was using chunks of it and did 12 oz of each item for this batch so I could have 1/2 dozen 2oz bars. Once your oil and beeswax are combined, add in your shea or cocoa butter, stirring until dissolved. Once all the ingredients are combined, immediately put the mixture into molds. I used square silicone muffin molds which made them easy to pop out and gave them a cute little shape. If you want to add any essential oil, you will need to do it at this stage – add a few drops of the oil of your choice, using a toothpick to incorporate. 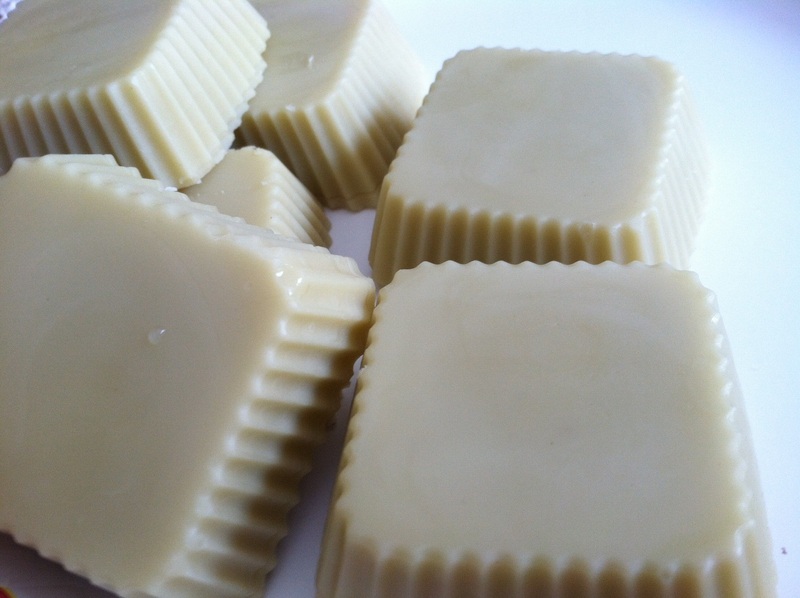 Don’t wait too long since the mixture cools rather quickly and this could affect the look of your lotion bars. Once the bars are totally set, pop them out of the molds and store them in a container for easy use. 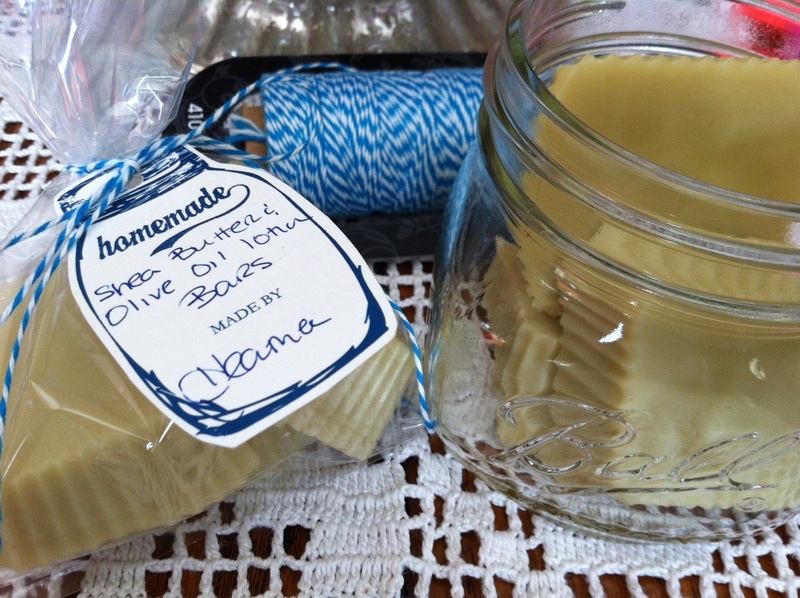 I packaged up a few as a gift in a clear bag with a cute little tag and bakers twine. The ones that were left for myself I stored in a wide-mouthed deco mason jar so they were easy to get to. The Shea and Cocoa butter as well as the beeswax I used were raw and unrefined, purchased through some great sellers on Etsy. I have a tub of organic unrefined coconut oil on hand at all times for all kinds of uses which I purchased at a local health store. The olive oil I use is purchased right from the grocery store! Links listed below if you need somewhere to get the ingredients that you can’t just walk into the grocery store and purchase! I won’t lie. When it comes to doing anything with my hair I am utterly, totally lazy. My hair is poker straight. Therefore my hair routine is that I wash it roughly twice per week (more if I happen to get dirty, sweaty, or have been swimming). In the summer I let it air dry a lot to help keep it moist. I will use a flat-iron only to smooth out any frizziness. That’s it. My products consist of shampoo, conditioner, and a little Argan oil to keep it moist and shiny. That’s it. But, it’s been hot out this summer. Hot as the fires of hell. Days where it feels like I could put dinner in the car while I’m at work and when I get home it’ll be cooked like I had it in the crock pot. Ya, it’s that bad. And my car does not have A/C. Sigh. So, I was looking for an alternative to my usual hot weather hair style of the pony tail or the sloppily looped through a hair tie style. 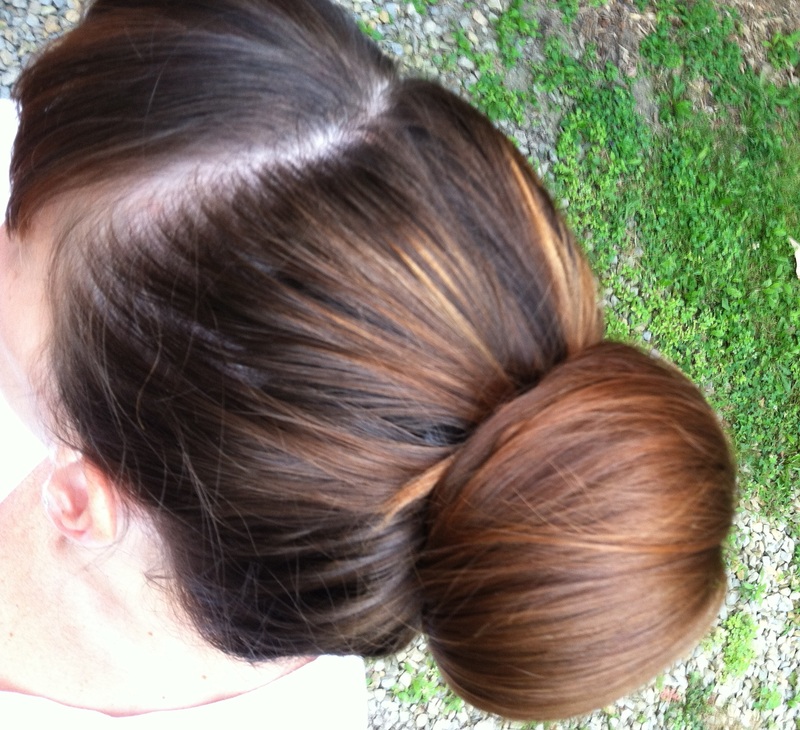 I had pinned how to make a sock bun insert to give your less than huge bun some oomph. 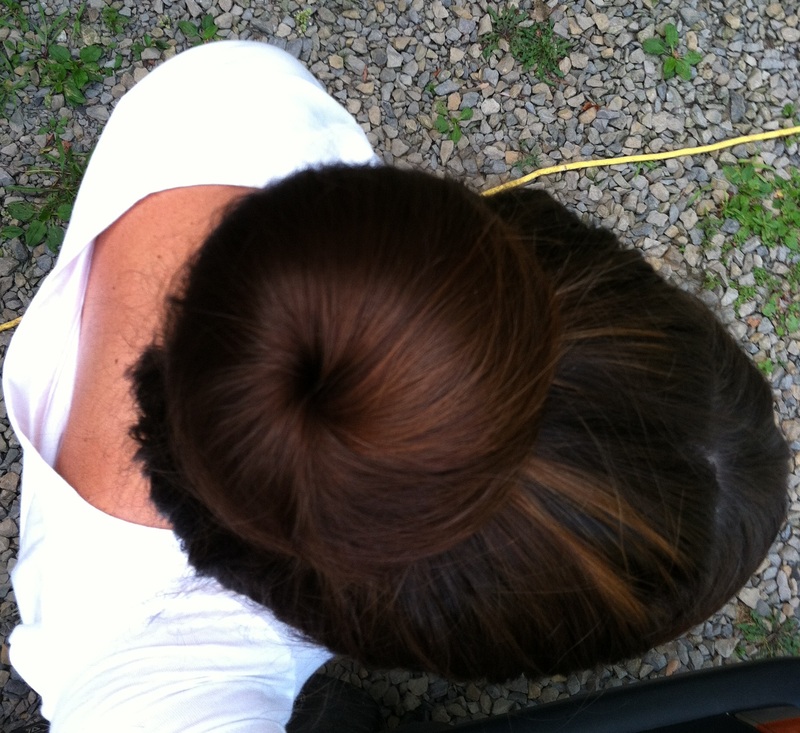 So, I sacrificed a brown sock and a tan knee-high and my bun booster was born. You then put your hair into a high pony tail (we were going for a ballerina bun type style here) – put your ponytail through the center of the sock bun, then wrap your hair around it, tucking the ends in as you go and securing the whole thing with bobby pins. Verdict? The style is super cute and easy once you get the hang of getting your hair wrapped and tucked. However, between the weight of my hair and the additional weight of the sock bun, my scalp was sore. SO, I think that going forward I’ll be sporting the sock bun at the back of my head, nearer to the base of my neck. It’s an easy before work hair style, as well as a nice change from my usual straight down ‘do. I’m not going to lie. I’m a pinterest addict. A total pinning fool. There are not enough hours in the day, money in my account, or room in my house to accomplish all the recipes, diy’s, and beauty routines. However, I do like to try to use or replicate some of the pins I pin. Otherwise, what’s the point of it all??? Onto the wavy hair idea – you put your hair in two pigtail braids, you twist the braided hair, and run a flat-iron over the twists. It’s supposed to result in something similar to beach wave hair. Me? I have poker straight hair. Super straight. Someone could hold me at gunpoint to get my hair to curl and it would still be pretty straight. So, I decided I would sleep on my braids. I had them in from about noon Sunday until 7:30 am Monday. 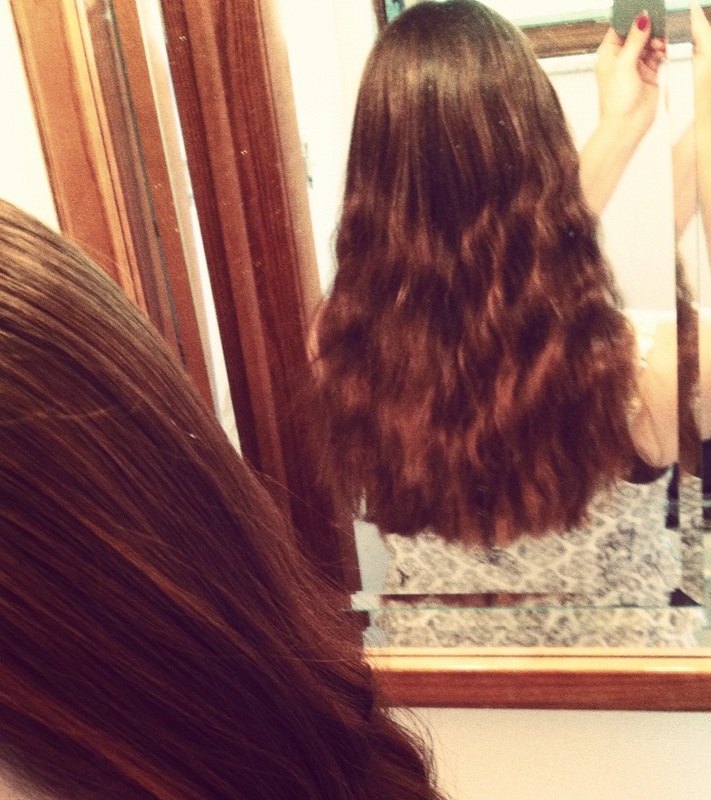 More time braided means more likelihood that the hair will maintain some form of wave. I decided upon testing this hairdo out whenever I had wet hair and the hubs wanted to take the motorcycle out to enjoy the beautiful day. Wet hair + helmet = dented, tangled, wind tossed roughness. So I put my hair into two cute little braids and made myself look about 12. Good thing we were going somewhere for lunch that people knew my husband hadn’t robbed the cradle. Off we went. Slept with the braids in all night, twisted them, then flat ironed. My thoughts: Not bad. I don’t feel like this is “beach wave” hair. It’s more like large-sized crimping. Or maybe a tighter beach wave. That being said, I don’t think it looks bad. It’s super simple – the most labor intensive part is making 2 braids, which didn’t take a whole lot of time. 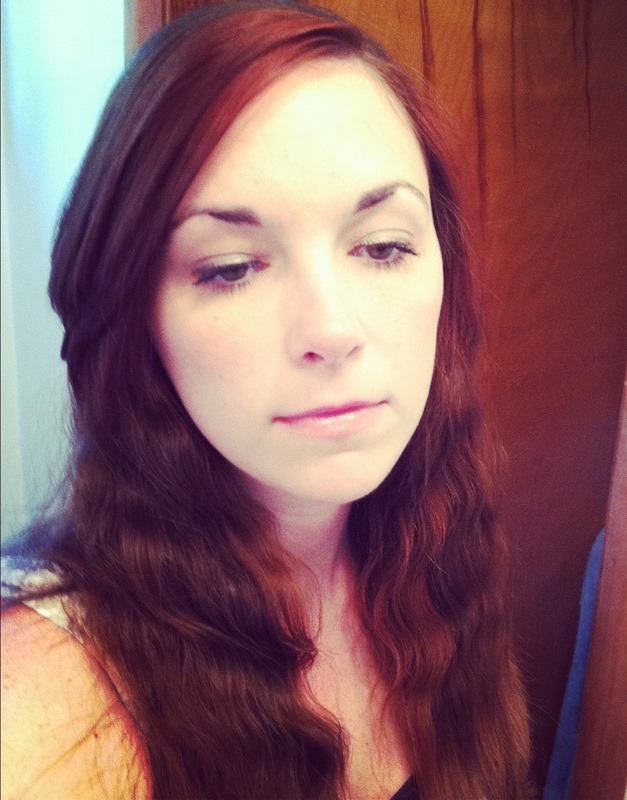 If I do this again I’ll skip the flat-iron part and twist the ends while it’s still braided around a small barrel curling iron. I don’t feel like the flat-iron really contributed anything, nor would it hold the waviness if I just braided, twisted, flat-ironed it. What do you think? Would this be something you’d try to speed up your morning routine?